Anand Mahalingam and Vineet Raghu hosted a dance competition Saturday night for two reasons — nostalgia and hunger. Literal, physical hunger. Strutting around the stage of the Soldiers and Sailors auditorium, the two Pitt graduates hosting Dhirana — the national Indian classical dance competition held on Pitt’s campus since 2013 — begged the audience of approximately 700 people to donate money to their fake personal charity. “We call it GUMWP — or, ‘Give Us Money, We’re Poor,’” Mahalingam said. The two men — both former members of Pitt’s folk Indian dance team PantheRaas — joked that it was meant to keep them from starving when Mahalingam returned to the working world and Raghu to grad school. GUMWP is not an actual charity, but the Birmingham Free Clinic — a University clinic under the department of medicine offering medical services for no cost to uninsured people — does exist. It received all proceeds from ticket sales and donations from the event by the end of the night, including the money gathered from the fake charity donations. Dhirana has served as an opportunity for Indian student dance groups across the country to showcase their skills and compete for trophies since 2013 — first place gets a cash prize of $1,000. The event has raised more than $50,000 for the Birmingham Free Clinic since its creation — this year it brought in more than $10,000. Exhibition teams that performed in the show between the competing teams’ performances included Pitt Avaaz, a South Asian fusion a cappella team, The Songburghs, an a cappella group on campus, First Class Bhangra, an Indian folk dance team, and PantheRaas. Classical Indian dance team Pitt Nrityamala was the host team at the competition. Multicolored lights flashed on costumes of blue, green, orange and red as eight teams of eight to 14 college women came from across the country to tell stories of modern relevance through classical dance. Teams travelled from as close as Case Western Reserve University in Cleveland and as far as the University of California, Berkeley. One of the teams, University of Maryland’s Moksha, choreographed a routine about a refugee child and his father. Garbed in bright blue and gold, they gracefully twirled about on stage and stomped their feet while telling how the father attempted to preserve his son’s innocence when their hometown was attacked. But the father dies, and there is nothing left to protect the son from the world’s disturbing reality. The dance earned the Maryland team first place at this year’s competition. Case Western Reserve University’s Nritya received the third-place trophy and University of California, Berkeley’s Natya came in second. Boston University’s Dheem received the $1,000 Traditionality Award, given by the nonprofit Srinivasa Prasad International Foundation for the Performing Arts to the team whose dance contains the most traditional elements. Mahalingam and Raghu were involved in the creation of the event and belonged to the group that runs it — Pitt Dhirana — before Mahalingam graduated in 2015 and Raghu became a doctorate student. Mahalingam said the event taps into social, traditional and charitable aspects through its connection to Indian roots, the showcasing of centuries-old dances and donations to the clinic. From the time he and Raghu were here, they said the competition had grown from having only 20 to 25 people on staff to this year having 108. The number of teams applying has also grown from nine to 20. Meera Tikku, a first-year communication major and Dhirana decorations committee member, said she found out about Pitt Dhirana through the student activities fair. She had danced before, but only in more Western styles such as tap and jazz. She said she only knew about Indian classical dance through “friends of friends” growing up, and those were more religious in nature. “It was cool to get to see it this way, because in the collegiate style of competition they tell it through a story, whereas in, if you’re not in collegiate competition, you tell it more through the stories of God,” Tikku said. The inspiration for the creation of Dhirana goes back to 2011, according to Guru Shrimathi Shobhitha Ravi, one of the seven judges present at this year’s competition and a former Pitt student and founder of Dhirana. Pitt Nrityamala won Laasya, a national competition for classical Indian dance that year. This meant Pitt had to host the 2012 Laasya. Some members of Nrityamala decided to start a competition held at the University every year after the performances at Laasya were well received on campus. They decided on the name Dhirana, after a musical syllable that is universal in Indian classical dance. This year’s codirectors were Insiya Attarwala, a senior athletic training major, and Priyanga Selvakumar, a senior neuroscience major. “Being part of Dhirana and just being a part of this community, I already felt closer to my roots, even just like back home in California. I am far from home and sometimes getting homesick, but these people are my family now and I connect with them on a level I couldn’t say for a lot of other people,” Attarwala said. Raghu said he decided to host because of the connection to India Dhirana gives back to those living in the United States. “Our parents are from India, so growing up in America, it’s kind of hard to get that connection. 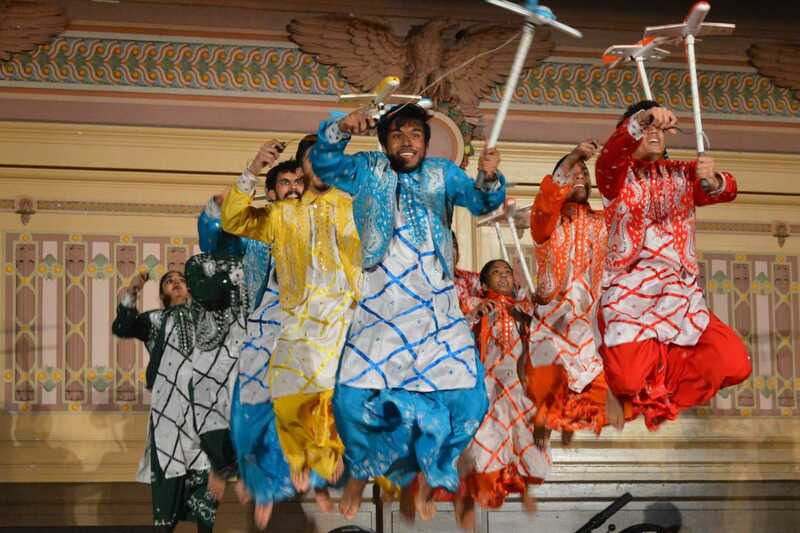 We were lucky to have a big Indian community in Pittsburgh, but this is one of the best ways to maintain that connection back to our roots,” Raghu said. The UMD Moksha team had been coming to Dhirana since its inception and has placed for the past five years. Mathavi Sankar, a UMD Moksha co-captain, said the team has earned gold since 2016, which is an improvement from getting bronze from 2013 to 2015.